It was a big day of basketball at Clinton County High School Saturday, with eight area teams taking part in the Robbie Davis Memorial Classic. The annual event pays homage to one of Clinton County’s most iconic athletic and business personalities, Robbie Davis, who died unexpectedly in 2016. 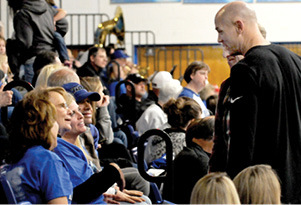 Shown here are a few scenes from Saturday’s Classic, including above, former U.K. standout basketball player Jeff Sheppard (1993-98) talked with members of the Davis family during one of the games Saturday. Sheppard’s son, Reed, played for one of the participating teams, North Laurel. 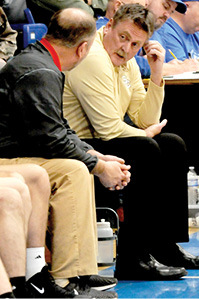 Below right, former Clinton County basketball standout player and Bulldog Coach Bobby Storie, made a return to the Lindle Castle Gymnasium Saturday, this time as the head coach for Smith County, Tennessee Owls. 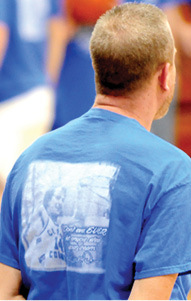 Below left, Clinton County Bulldog head coach Todd Messer watches the action from the sidelines, wearing one of the Classic t-shirts that all participants were given, showing Davis cutting down a net after Clinton County won the 1982 District Tournament.